The Fen Raft Spider, Dolomedes plantarius (Clerck, 1757), is known from only two sites in the UK: Redgrave and Lopham Fen in east Norfolk, and the Pevensey Levels in East Sussex (Smith, 2000). This spider typically builds its nursery webs on vegetation close to open water, where it hunts. However, there appear to be no published details about site selection for nursery webs. Here, we report the results of such a survey, undertaken in 1999 on the Pevensey Levels, a wetland area consisting of drainage dykes dividing up grassland areas grazed by cattle. Methods: We selected twenty dykes, mean length 170 m, in which spiders and nursery webs were both evident. In total, 132 nursery webs were located and the following information recorded for each: the location of the web in the dyke, including aspect; the plant(s) to which the webs were attached; the extent of grazing around the web (on a subjective five point scale from 1 (no grazing) to 5 (heavy)). Results: The results show that the nursery webs have a patchy distribution within the dykes, with floating vegetation in the centre of a dyke by far the most favoured location (see Table 1). Vegetation type may also influence relative abundance of webs (see Table 2). The Water Soldier, Stratiotes aloides, although only found in three ditches, supported by far the greatest number of webs. A relatively large number of webs were found on the rush Juncus effusus, but this was also the most widespread vegetation type, found in all but one of the dykes sampled. The majority of dykes showed no evidence of grazing (see Table 3) and, although data are limited, there is little indication that grazed dykes have fewer webs. Discussion: Although from only one season, the results of this survey are clear: Dolomedes plantarius nursery webs were most commonly seen on Stratiotes aloides floating in open water in the middle of the dyke. This information may be interpreted in two ways: it may reflect site selection by the spiders or, alternatively, it may be the result of differential web survival in the various ditch locations. It is worth noting that at other sites in the UK and continental Europe, D. plantarius nursery webs can often be found in marginal vegetation (Duffey, pers. comm. ), which tends to support the latter conclusion. However, another Raft Spider, D. triton, has been observed to make webs on emergent vegetation only when floating vegetation is unavailable (Bleckmann & Rovner, 1984). The grazing data (Table 3) are inconclusive, but trampling by cattle (not recorded) might be significant. In addition to land-based grazers, Mute Swans, Cygnus olor, feed in the dykes. They will consume other floating vegetation, but leave the Stratiotes untouched. Where Stratiotes filled a dyke, nursery webs were even more abundant towards the centre, suggesting the importance of this as a 'refuge zone'. The information presented here indicates that on the Pevensey Levels the fate of D. plantarius may be interlinked with that of Stratiotes. This plant is not particularly abundant on the Pevensey Levels, so management measures that increase its proliferation may also benefit the spider. Acknowledgements: We thank Neil Fletcher, Evan Jones and Eric Duffey for help in planning/writing up this project. Bleckmann, H. & Rovner, J. S. (1984) Sensory ecology of a semiaquatic spider (Dolomedes triton). Behav. Ecol. Sociobiol. 14: 297-301. 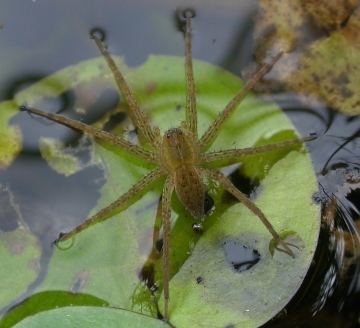 Smith, H. (2000) The status and conservation of the fen raft spider (Dolomedes plantarius) at Redgrave and Lopham Fen National Nature Reserve, England. Biol. Conserv. 95: 153-164.